Sleeping in our car turned out to be quite uncomfortable… We had found a beautiful and cheap campsite next to a lake and near the Orpen gate but it was inhabited by millions of ants and we therefore didn’t dare putting up our tent. Thanks to camping, we got used to getting up early in the morning and so we had plenty of time to enjoy our first day in the Kruger national park. There were lots of Impalas with their offspring, who either clung to their mothers or were lying around in what seemed to be an Impala kindergarten. 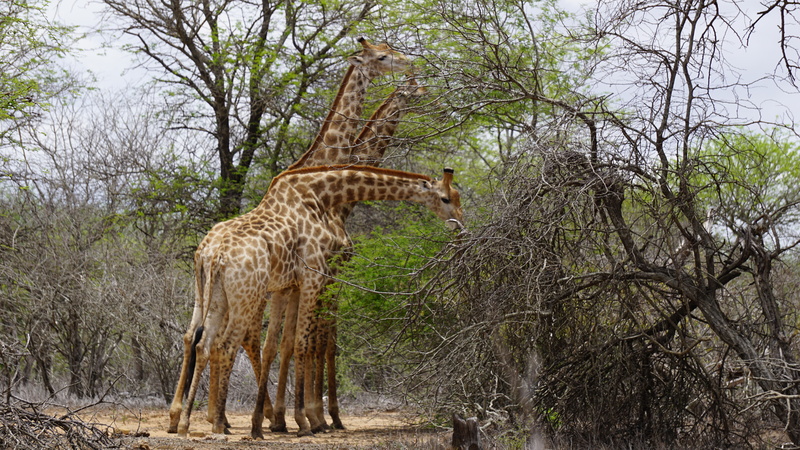 Next we saw giraffes, first from a distance but later they were crossing the road just in front of us. Then came finally the elephants and in the evening, we crossed a waterpipe which was inhabited by hyenas. They came out of the pipe just as we drove over, so we stopped to take some pictures. There was a baby hyena who was scared of us but its mother encouraged it to come to the road and there she first played with it and then licked it right next to our car- and we caught it all on camera. We spent the first night in the Satara camp and got up early the next day to explore the northern part of the Kruger park. Again we met elephants on the way and almost got attacked by a mother elephant who didn’t like it when we took pictures of her babies (even though we didn’t get close). We also saw rhinos and hippos from a distance. On the way to the camp, we stopped at a pond and watched three lionesses who had just enjoyed a kill and were lazily lying around, digesting their food. They were surrounded by marabous who couldn’t wait to get a bite from the carcass. At the camp, we (meaning René and Nici) were spoiled with a delicious vegan dinner by our cook, James. Our walking trail started at 4.30 am the next morning and right at the start we had a close encounter with a hyena. The rangers told us to stand still since hyenas only see movement. Nici found that rather hard because she’s in love with hyenas and she wanted to pet it. The cute little (or big) fella didn’t see us and came really close until the rangers started making humming sounds which scared it away. It was an incredible feeling to walk through the wilderness, knowing that we could run into a lion or an elephant at any moment. The rangers told us a lot of interesting facts about animals and plants that we saw on the way. We found many bones and tracks, including a leg of some animal which had been killed and dragged up a tree by a leopard some days before. There were lizards and tortoises on our path, lots of empty tortoise shells too, which was hard for Nici, because tortoises are her favorite animals. Apparently birds pick them up and drop them on rocks from high above to crack their shells and eat them. Nature’s cruel. After a delicious brunch and a siesta back at the camp, we left for the evening walk and saw three lionesses (probably the same as the day before). The feeling was entirely different though, since we were on foot and there was always the possibility of being attacked. They had already eaten but if we had gotten too close it might have annoyed them and led them to attack us. The day ended with a sundowner by a water pond and a (again) delicious dinner in the camp. On the next morning walk we came across soldier ants who were busy transporting body parts of termites back to their queen. Whenever one of the colony got too tired to walk, some of the bigger ants would pick them up and carry them back to the others. It’s amazing how these little animals are organized. There’s much we can learn from them. It started to rain that afternoon so we went on our last Sweni safari by car. We got really lucky and met a mother rhino with her baby on the road. 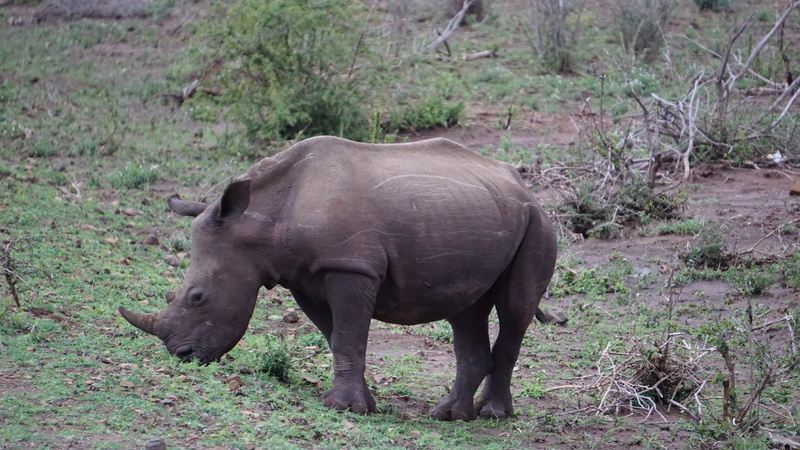 After that we saw rhinos twice more, at least eight of them. Then we had to stop because a herd of giraffes crossed the street and later we enjoyed our sundowner while watching a group of male lions. After spotting several hyenas it was already dark and our rangers wanted to bring us back to the camp. But when we arrived at the bridge we had crossed earlier, we found that the river had flooded it completely. We discussed trying to drive through the water, it wasn’t that deep but the current was really strong… Walking through the river was no option, because there were lions in the area. The water remained even after we waited a while. So we checked the only other way to the camp but that too was flooded. The only thing to do was driving back to the Satara camp where our rangers organized some cottages for us to sleep in. We felt bad about it though because James had prepared a barbecue to celebrate the last night of the trail and he was waiting alone in the Sweni camp and had no idea where we were. We tried to make the best of it and ate some muesli bars and had our sundowners in the family cottage, where we had been placed. Then we went to bed, wondering whether the water had gone down and whether the rangers were able to pick up James from the camp. If there was no way in, there was none out of the camp either. But five minutes later there was a knock on the door and Ronnie and Rhulani arrived with James and pots full of food :) They had been able to cross the river after all and picked up our personal belongings from the Sweni camp. We arranged the table and had our “last supper” in the family suite, which was nice too, because there were no moths committing suicide in our drinks. All in all we were happy with how things had worked out and for us it was a big adventure! Our group had to split up the next morning and we had to say our goodbyes… nowadays it’s easy to keep in touch though and it’s great to have friends all over the world. We used our last day in the park for another safari, this time we drove to the south. We had only been driving for a couple of minutes, when we noticed several cars standing on the side of the road. The people in them were looking at something. One of the drivers told us that there was a dead rhino next to the road. We were shocked at first because we thought it was killed by poachers but when we got closer we saw that it was the baby rhino we had seen the night before and that there were three male lions lying around it… stretching their tired limbs and digesting the rhino. It was really sad and left us speechless because only hours earlier we had seen that little cutie grazing by the road with its mother and now it was dead. 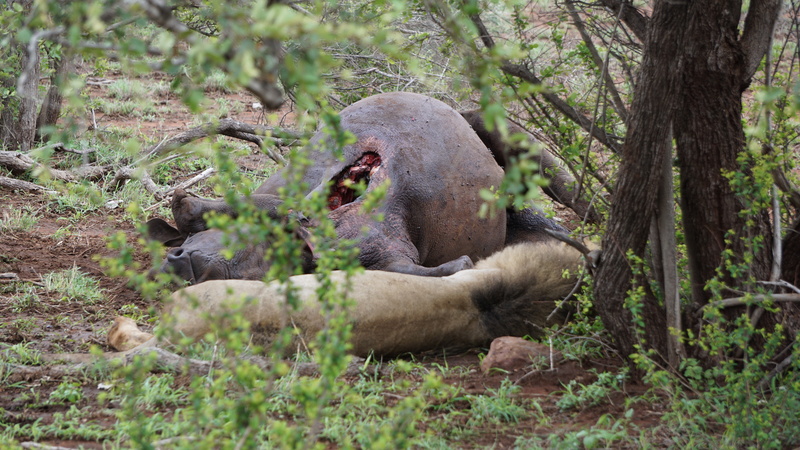 We heard from one of the other guys at the scene that he had seen the lions eating the rhino that morning, which meant that it hadn’t been dead for that long and that it must have been a very long fight. We wondered where the poor mother rhino was. We didn’t want to linger around for too long, so we drove some miles further and saw a leopard on a tree, only a couple of meters away. 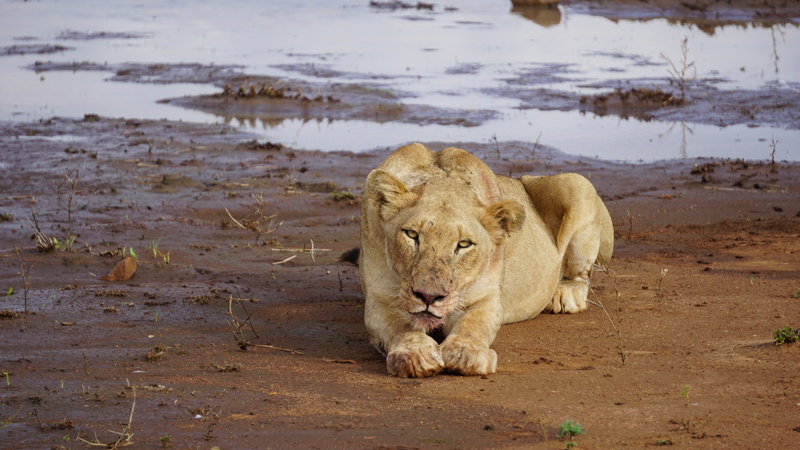 Then we saw more lions- one walked straight towards us and was only 1,5 meters away from our car. René got lucky and saw his beloved warthogs and later a lake full of happy hippos :) There were even some crocodiles in that lake and when we drove by a group of water buffalos we could not have been much happier… Apart from cheetahs we saw everything that we had wished for in those 5 days that we spent in the park. Sounds good but unfortunately most poachers are not caught and poaching is still a severe problem in the Kruger park. According to our rangers, only three months ago there was a huge scandal when one of the big bosses of the park was caught right on the scene. The vet was involved too. They had killed a rhino to sell its horn. Rhino horns are popular especially in Asia. They’re nothing but keratin- the same as our hair and fingernails are made of- but they’re viewed as a status symbol and 100 g powder is worth USD 2500 in Vietnam (one Horn weighs about 1-10 kg). Even though the Kruger national park has increased its amount of rangers, it’s impossible to cover the whole area. When we were sad that the supermoon was covered by clouds, one of the residents told us that this is actually a good thing, since a full moon in South Africa is often called a “poacher’s moon”, because its light is so strong that it’s easy for poachers to hunt rhinos. You can support the fight against poaching by donating to anti-poaching organizations. Just take some time and inform yourself online- there’s plenty of information about poaching and how to participate in ending it on the internet. 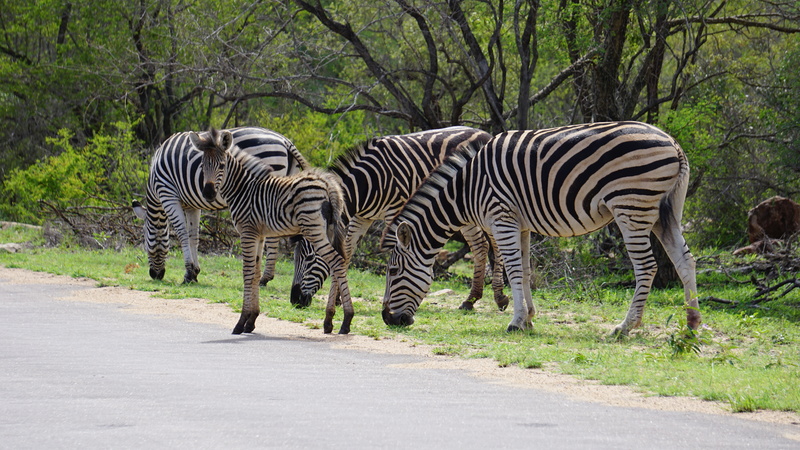 The cheapest way to enjoy the Kruger park is by renting a car and driving through the park yourself. You have to pay about R300 per day if you’re an international visitor. If you want to stay overnight (to see the big five you probably need more than one day) the cheapest way to do so is camping. However, if you want to enjoy the wilderness and get really close to the animals, we advise you to book a walking trail, such as the Sweni trail. 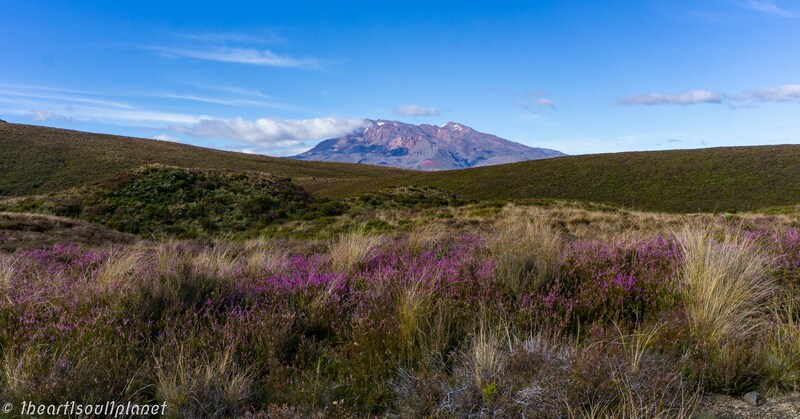 You’ll be guided by rangers who know how to find the animals (of course there’s never a guarantee that you’ll see the beautiful 10*) and you’ll learn many interesting facts about the local flora and fauna. You can also book safaris by car, but in our opinion if you do so you might as well rent a car and pay less. By booking a walking trail, there will still be times when you’re in one of the safari buses so you practically have a walking and a driving safari combined. Also you get to sleep in a small camp out in the bush- surrounded by nothing but wilderness- which is incredible :-) We’re really glad to have treated ourselves and booked a walking trail and it was absolutely worth overstepping our daily budget! The walking trail cost about R5000 per person, including the conservation fees (R900 for three days), the accommodation and the catering. 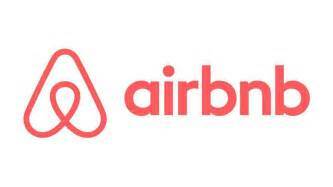 Cheap accommodation and meet locals at the same time? Looking for some adventure in India? You want to know who your ancestors were? You want to do something for your Karma? 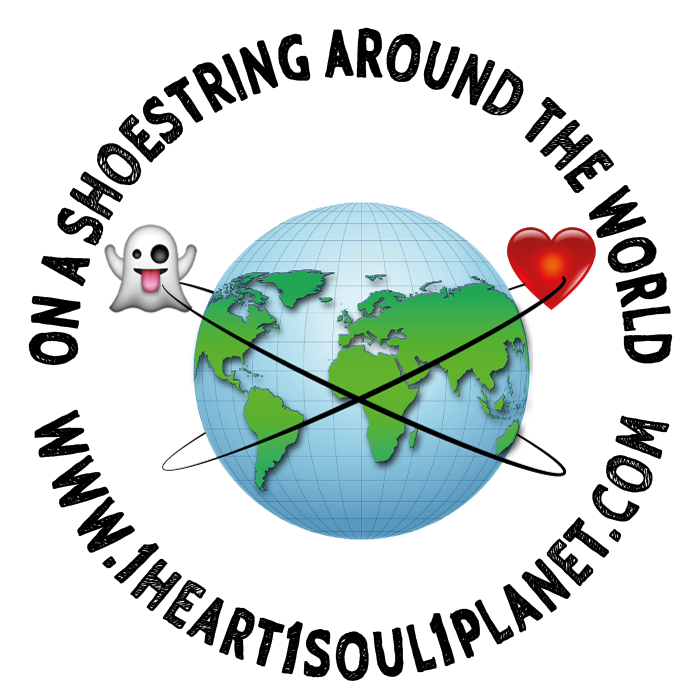 © 2016 1heart1soul1planet. All Rights Reserved.